cell phone | brian habbe | life ..
Around this time last year I was happily using my G1 Dev Phone on AT&T, even though it was meant for T-Mobile, until the keyboard went bad. Not every key but a few, P, backspace and the back arrow. 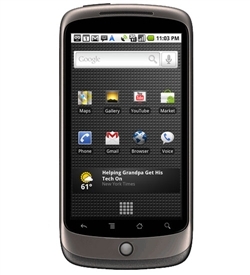 My replacement was the HTC Aria. An excellent phone, hackable, and served me well…. until the last week or two. Which was not expected. The touch sensor on the screen is messed up, keyboard recalibrating didn’t help and neither did switching ROM’s. No phone insurance and only a year into my contract getting a replacement from AT&T didn’t look that appealing. Time to go unlocked again!! I enjoyed the physical keyboard of my G1 Dev Phone very much and was hoping to get something like that again. AT&T has a wide selection but not what I’m looking for, mainly because the hit on price if not committing to a longer contract. Going the unlocked route opens up options, but the latest and greatest will be even more pricey. I’d have to settle on something that’s 6 months or older. It didn’t take long to find the HTC Desire Z, it looked ideal. 3G or 4G data is not important but knowing was a version for AT&T’s GSM spectrum was a plus. Of course prices though were more than I wanted to pay so it was off the list. Enter the Nexus One. I had almost forgotten about it until checking Newegg’s list of unlocked phones. No physical keyboard but that was more of a want than a need, a virtual alternative would be fine with the right package. I passed on it at the start of 2010 for a few reasons, the G1 was still working fine and the price was in laptop range. But that was a year and a half ago, a really long time in the world of mobile phones… crazy but true. With what Newegg was offering, and the need for a phone, it was a deal I couldn’t pass up. It showed up a few days ago and came loaded with Android 2.2. A few hours after it was on I got a OTA notice for the 2.3.4 update to Gingerbread. The configuration options are less than what I’m use to with Cyanogenmod but that’s ok for now, I’ll root it later. My only hope is I can get more than a year out of this one. Read an interesting article about the IPhone and access to Microsoft Exchange Server email. The full article is Wipeout: When Your Company Kills Your iPhone and I found it on Slashdot. That seems a little extreme, but I guess when you think about it work email is the company’s not yours. I’ve yet to add work email setup to my phone. It might be another reason not to. I don’t have an IPhone, but Android phones have a MAPI email client for Exchange access, which is what mine runs. I’d have to assume it works the same way. I’ll stick with browser access !!! Just after updating my G1 to 1.6 I was struck again with problems syncing contacts. Mind you it’s not a huge deal, I don’t meet 20 people a day and need there digits. It has been a common problem and was well documented based on the posts I found. The consistent fix from the Google Mobile Help forum was clearing contact data on the G1 and then sync. That worked and syncing is back. This might be a good argument for turning on synchronization but that tends to limit battery life. If all else fails I can fall back to this but I’m hoping if I sync more often, and not make changes in both places then sync, the problem will go away. We’ll see.